This information is not essential to be able to play Kingdom, but is invaluable for players aiming to become an Emperor. Abandon : It's not possible to abandon a game which is underway. However, if you don't take your turns, your kingdom will be considered destroyed and your game will finish after a couple of days. Defend : Your general can defend a location within your kingdom. This can be done in order to automatically defend a location in case of enemy attacks. When you are victorious during a battle, your general will automatically defend a location, this will stop your enemies from seizing a location which has been left undefended. Trade cannot be increased while a general is defending a location. Provoke : You can choose to provoke an enemy general. The enemy general will then be forced to attack you, and your general will find himself on the defensive. Barbarian Troops : If your capital is conquered by another player, your kingdom will be destroyed. All units who were defending villages under your control will become roaming barbarians. They will defend villages from attacks by all players. However, if you attack them, they will recognise their old master and request to join your army. You can either accept or refuse. If you refuse, you must then defeat them in battle. 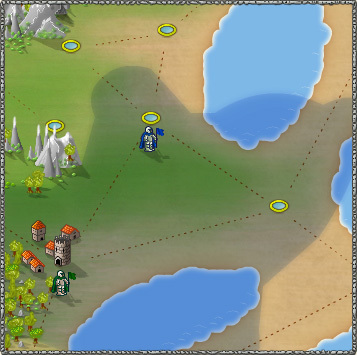 Donation of Territory : A follower can take control of one of his master's villages if it is left undefended. This allows masters to donate locations to their followers. Multiplayer Attacks : If two players are already fighting each other, you can join one of them, either helping to defend or to attack. The winner of the battle will take control of the location where the battle has taken place. Wasted Turns : if you already have the maximum number of turns, but do not use them, these turns will be considered wasted turns. If your total number of wasted turns exceeds the maximum number permitted (equal to 5% of turns played) the turn will automatically be played without any production taking place.